The U.S. Department of Energy announced today that Lawrence Berkeley National Laboratory (Berkeley Lab) will receive $30 million over five years to build and operate an Advanced Quantum Testbed (AQT). Researchers will use the testbed to explore superconducting quantum processors and evaluate how these emerging quantum devices can be utilized to advance scientific research. As part of this effort, Berkeley Lab will collaborate with MIT Lincoln Laboratory (MIT LL) to deploy different quantum processor architectures. According to Irfan Siddiqi, Berkeley Lab scientist and AQT director, one of the goals of this project is to set up a multi-partner scientific collaboration to build a platform where basic outstanding questions about quantum computing can be answered. AQT will operate as an open resource for the community, allowing external researchers to evaluate superconducting architectures developed by testbed staff and collaborators for simulations in chemistry, materials, and other areas of computation. AQT will also help industry researchers by exploring what approaches are most likely to work and which ones do not. Industry can then take the solid ideas developed by the testbed and transform them into finished commercial products. 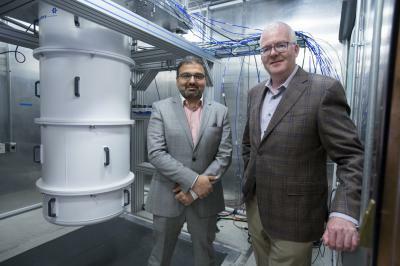 "With this testbed we will ask and evaluate the basic questions needed to guide the future development of quantum computers," said Siddiqi. "We are the first to commission an instrument to look at this problem end-to-end in an open research collaboration between academia, industry, and the national laboratories. This means that we won't rely on any one entity for all of the answers. Instead, we will use a tried-and-true scientific approach – we will seek out the best ideas, hardware, algorithms, etc. and combine all of that expertise to communally build a quantum testbed." According to Jonathan Carter, deputy of science for Berkeley Lab's Computing Sciences Area and the AQT's co-principal investigator, Berkeley Lab is uniquely suited to lead this effort because the capabilities of its researchers allow them to attack this problem end-to-end. Over the past five years, Berkeley Lab researchers developed quantum chemistry and optimization algorithms targeting prototype superconducting quantum processors funded by Laboratory Directed Research and Development (LDRD) grants. They proved the viability of their work by running these algorithms on a quantum processor comprising two superconducting transmon qubits developed in Siddiqi's Quantum Nanoelectronics Lab at the University of California Berkeley. The success of their LDRD work eventually paved the way for two DOE-funded projects to explore quantum computing for science. "AQT is essentially the next phase of our research," said Carter. "Our LDRD project allowed us to make some initial progress on what quantum computing hardware and quantum algorithms would look like. We then got to test the viability of our ideas and create a roadmap for building a quantum testbed with our DOE-funded Pathfinder project. Now with our DOE-funded AQT project, we are actually going to build the testbed and open it up to external scientific researchers." "Because our team can design and fabricate quantum processors with considerable flexibility, we can tailor the design to meet our scientific needs," Carter said. "We also have team members who are working on the classical control hardware and software needed to operate these chips, as well as the algorithms that will run on them." According to Carter, the broad expertise of the Berkeley Lab team is critical at this moment because the use of a near-term quantum computer requires experts from many disciplines to optimize all of its components – for example, qubits, quantum control, error mitigation, etc. – simultaneously because quantum computers are currently so resource constrained. In addition to the collaboration with MIT-LL, AQT will tap resources and expertise of a number of DOE user facilities, including the Molecular Foundry and National Energy Research Scientific Computing Center, both located at Berkeley Lab. Additionally, researchers from Berkeley Lab's Accelerator Technologies and Applied Physics Division will help develop custom quantum control hardware, while the Materials Sciences Division will help with research and materials fabrication and the Computational Research Division will help develop low-level software and custom classical computing architecture. The Advanced Quantum Testbed is the latest project for Berkeley Quantum, a partnership that harnesses the expertise and facilities of Berkeley Lab and the University of California, Berkeley to advance U.S. quantum capabilities by conducting basic research, fabricating and testing quantum-based devices and technologies, and educating the next generation of researchers. Get more information about quantum information science research at Berkeley Lab and Berkeley Quantum. The Advanced Quantum Testbed will be funded by the Department of Energy's Office of Science (ASCR). DOE's Office of Science is the single largest supporter of basic research in the physical sciences in the United States, and is working to address some of the most pressing challenges of our time. For more information, please visit the Office of Science website at science.energy.gov.